I’ve always struggled a bit with poses that require flexibility in the shoulders and hips. I muscled through yoga postures like any other workout and hoped for the best. Downward Facing Dog was particularly difficult, and I did the best version I could while still keeping up with the class. I’m not sure about you, but Downward Facing Dog didn’t feel much like a “resting position” to me. What I finally realized was that some of the back stiffness I was feeling after class was due to straining in poses requiring flexibility and strength beyond my ability. I needed to bring in props to do a modified Downward Facing Dog. 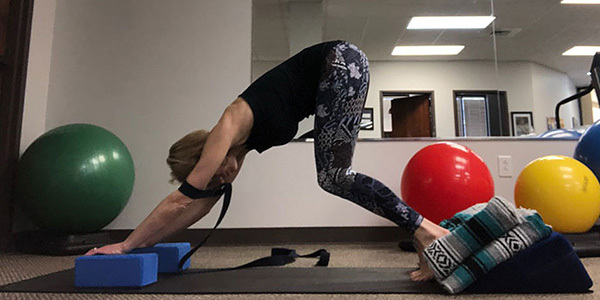 Whether you are new to yoga, have practiced for many years or are working your way back to asana following injury or illness, props (blocks, blankets, straps and wedges) may help. 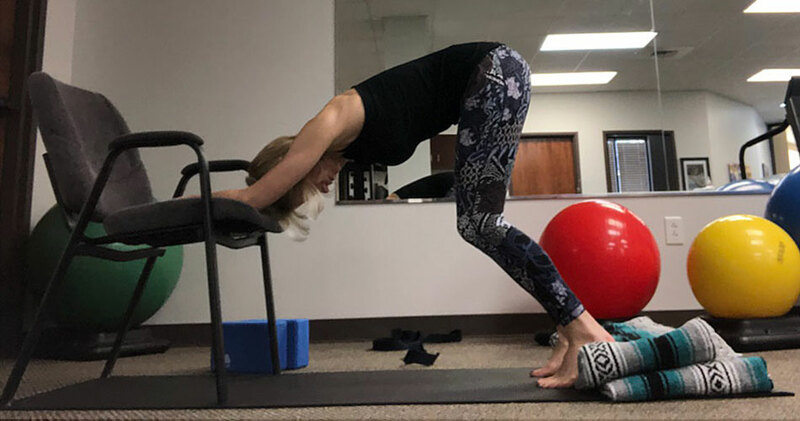 I’ve learned through my own practice and yoga therapist training that props allow for better connection with the pose without the stress and strain on the body. #Winning! Two folded blanket will bring the floor to your heels. Blocks are helpful for tight wrists and fingers. A chair decreases the body weight for shoulders. Use a strap above elbows or knees (not shown) to help engage shoulder and hip lock. A wall allows support of upper body and full contact of feet on ground. Similar to blankets, a wedge helps to bring the floor to your heels. You may use on its own or with blankets as shown below. 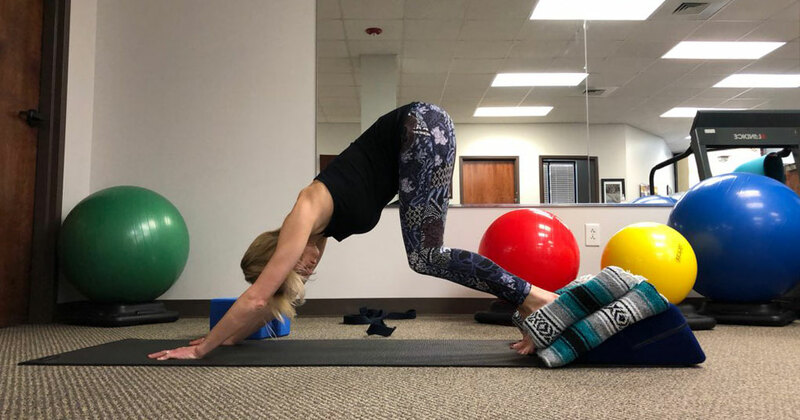 I am honored to share how to use props for a modified downward facing dog for those of you who are not yet down with the dog. Take a look, and ask your yoga instructor or therapist to discover the right modifications for you. This is a great starter option for a modified Downward Facing Dog if you can’t quite manage full weight in your wrists or shoulders, or if (as in my case) your shoulders and/or calves are tight and need some gentle warming up. It’s a great way to tune in to your breathing without the full weight of your body. If you have the hip and spine flexibility, you can keep your knees straight as you press back into the pose. If your wrists or fingers are uncomfortable being flat on the mat, blocks can provide a good option. Make sure that your blocks have a good grip on the mat, as you will want them to remain in place when you press up into position. The strap is positioned above the elbow and helps to engage the shoulder muscles more easily. It’s great to use a strap early in practice to feel your shoulders working, and then try without it once you are warmed up. You can do this without blankets or wedges if you are able—I would love to get those heels on the floor! But if you have short Achilles tendons (high heels, anyone? ), find a way to ground them comfortably. This will allow you to work into the pose and actively lengthen your calf muscles and tendons. Likewise, if your shoulders and wrists allow, you can place your hands directly on the chair. Work on keeping your spine neutral and lift your tailbone up- keep your knees bent as needed. You can see I am lifting a little too high here and am rounding my spine a bit (it’s harder than it looks!). 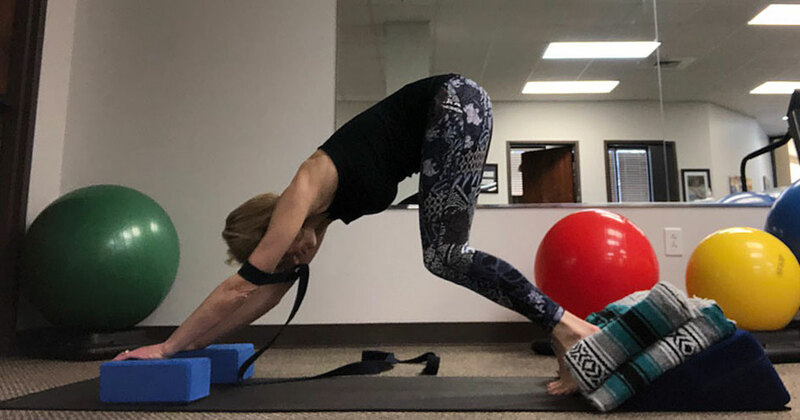 If you are in a flow class and are just not able to get those blankets in place, staying active on your toes while minding the spine is an option. Once you figure out the placement of your blankets, you can work into the pose by pressing from shoulders to hands and hips through heels, keeping your tailbone lifted and your breath relaxed. 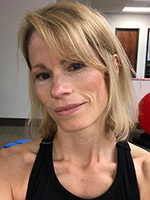 Sarah Talley, PT, DPT, PYT-c is a physical therapist and co-owner of Carolina Pelvic Health Center, Inc. in Raleigh, NC. 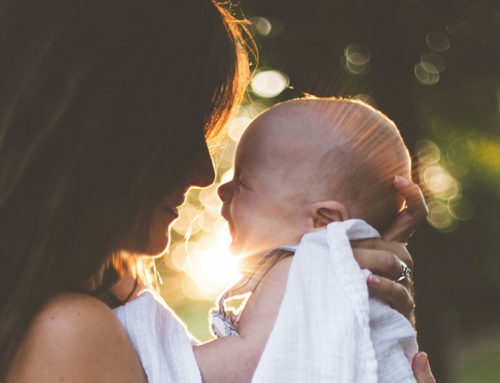 She focuses her practice on treating clients with pelvic health needs and is currently completing training as a Professional Yoga Therapist through PYTI. Off the mat, Dr. Talley can be found running, hanging with her husband & pup, and laughing with family and friends. Sarah and I have been friends and colleagues for many years. I am SO fortunate that she will join me as my teacher assistant for my upcoming course, Yoga for Pelvic Pain in Kansas City. I suffer from vertigo periodically and cannot tilt my head down lower than my heart in downward facing dog. I modify other poses but this one is a mystery. Can you suggest? I liked the pose at the wall since the head is not below the heart. 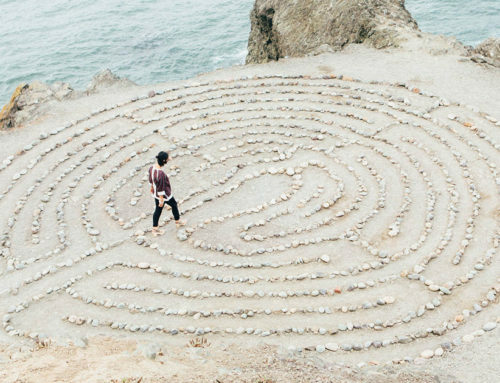 Can you suggest any way to incorporate this into the vinyasa flow?